Cosmesis : Refers to the correction of a disfiguring defect. 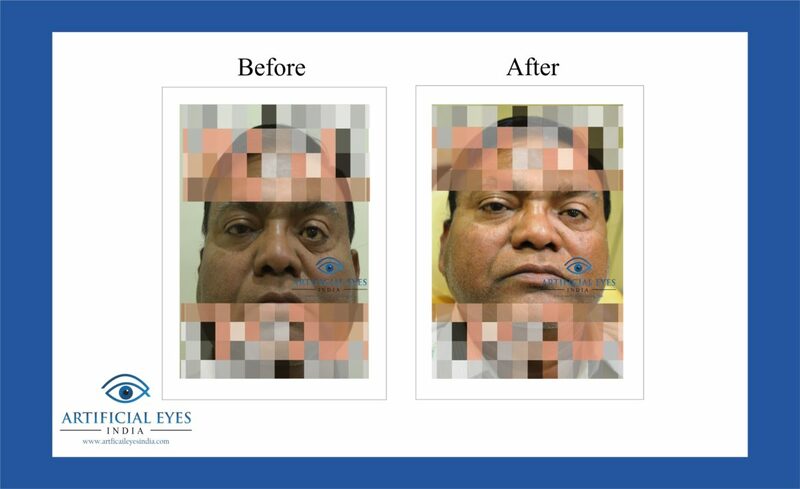 He is 54 years old and has worn an artificial eye since he was 27. His monocular vision and loss of prosthetic stability was a problem due to the loss of depth perception which caused him to give up his job. He presented for a review of his artificial eye which he got made somewhere else but was not retainable in socket. His existing prosthesis was around 20 years old, discoloured and sat too low in the socket. His socket was healthy but the fatty orbital tissues was causing a shallow upper lid sulcus and lower lid laxity. First of all cosmetic correction was done by placing sling suture. The replacement prosthesis (see photo) was made retainable and more look alike. This dramatically improved the cosmesis and his confidence too. It also provided a platform from which his volume deficient socket can be assessed and possibly corrected by surgery. He was advised to leave the prosthetic eye in place overnight and to only take it out once a month for cleaning.